In honor of Greenland, we’re celebrating a new holiday here at ODNT! This post is part of a series. 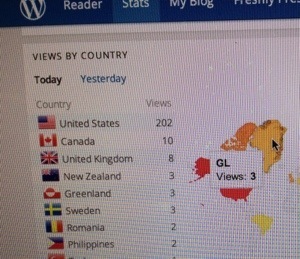 Long story short – I noticed recently that I had no readers in Greenland. As in ZERO. Which is completely ridiculous. And it got me to thinking … Wouldn’t it be awesome to GO to Greenland? I could write a review of the entire country while making new friends along the way. And I could chronicle the whole thing. Right here on ODNT. To follow the dumbassery, please check out the posts that led up to this one. Hello, Greenland? Can You Hear Me? OMG, You Guys! Greenland Called!!! There I was … standing in the middle of the Target parking lot in the rain. If it wasn’t weird enough that I stopped what I was doing every hour to take a picture of my day, I was now jumping up and down laughing (again … in the rain!) because of an email notification I received about a comment left on ODNT. Honestly, I expect that many of you are actually jumping up and down with me at this point. What a banner day at ODNT! We literally conquered another country, my friends. (I still contend it should be a continent, by the way. And I am not done fighting for you, Greenland! To quote American Actor Al Pacino in one of his most noted films … “Oh, I’m just getting warmed up!”) Needless to say, I just had to check my stats that very night. I needed to see it … right there on the screen … and then share it with you guys. Today is the day to celebrate like a Greenlander. Kick back with an icehouse brew or maybe just some coffee. But don’t be surprised when you see the bartender put whiskey, Kahlua and Grand Marnier in your glass then set the whole thing on fire. Which reminds me … don’t forget to appreciate the sun today! Greenland goes without it for long periods of time during the winter months and so, as you can expect, it’s literally cause for celebration when it shows its fiery, skin-damaging face again. So Go! Hug the Sun!! And Happy Dani Henriksen Day, Everyone!!! This entry was posted in Uncategorized and tagged dani henriksen day, greenland readers on the blog. Bookmark the permalink. I see President of Greenland in your future, ma’am. You’ve got Greenland in the bag! Congrats on your successful Greenland infiltration. 😉 You are too funny. Oh my goodness! You are conquering Greenland visits one day at a time! Congrats! This series is hysterical!!!! I thought I had 300,000 readers in India. I had no idea Indians liked my Ohio sense of humor. Then I realized I was looking at the ANALYTICS EX AMPLE. Those people in India need to get WITH it.